If you’re coming to North Myrtle Beach, South Carolina, you won’t want to miss the variety of events taking place in the surrounding area. 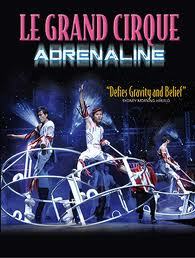 The spellbinding and magical Le Grand Cirque Adrenaline brings top class entertainment, fun and laughter to the stage of The Palace Theatre. This brand new show features new acts, mesmerizing costumes, and incredible music. The breathtaking spectacle displays feats of strength and incredible skill that will take your breath away. It produces so much excitement and electricity, it could light up the entire Grand Strand! The show runs from May 30 – Sept. 4, Mon. – Sat. at 8 p.m. with matinée shows on Wednesdays at 10 a.m. and Thursdays at 2 p.m. Need a place to stay? Check out our Myrtle Beach condos where you’ll have more than 60 oceanfront rentals to choose from in the area. All have outstanding amenities like pools, hot tubs, Jacuzzi’s and plenty more. When you stay in our Myrtle Beach condos you’ll be close to all the action taking place in the Grand Strand. Don’t miss a single minute of it! 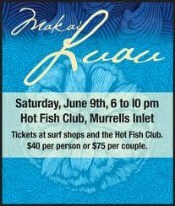 The 7th Annual Makai Luau, a Grand Strand tradition, will be held June 9th at the Hot Fish Club located in Murrells Inlet, SC. The ticket-only benefit begins at 6 p.m. on the lawn of the Hot Fish Club and will feature live music, a fire and hula show from Chief Kamu, a traditional luau buffet, beer and wine beverages, as well as the wildly popular Surfers Punch. There will be prizes for the Ugliest Hawaiian Shirt contest, a Best Lei contest, and more. All proceeds from this event fund the projects of the Grand Strand Chapter of the Surfrider Foundation, a grassroots, non-profit, environmental organization that works to protect our oceans, waves, and beaches. Tickets are on sale at area surf shops, through any local Surfrider member, or by visiting Surfrider’s website www.surfridergrandstrand.org.